Not every blues fan has the resources or time to be able to attend the annual Legendary Rhythm & Blues Cruise, which is a seven-day floating musical festival that tours the Caribbean. This event is a fabulous opportunity to meet your favorite blues artists and hear more live music in a week than many people experience in a lifetime. If you cannot make the cruise, the next best thing would be listening to a copy of Mitch Woods’ Jammin’ on the High Cs. Mitch Woods is an amazing showman and an American treasure. He is a classically trained pianist who joined the blues fold after relocating from New York to the San Francisco in the early 1970s. Mitch and his band, the Rocket 88s, have released nine albums over the years and their unique blend of Chicago blues, boogie-woogie, and West Coast jump blues is infectious. Woods’ Club 88 Piano Bar has become a fixture on the Blues Cruise, and you never know who might end up sitting in for a song or two. Jammin’ on the High Cs was recorded over two days on the January 2015 voyage and does a nice job of capturing the overall mood of the experience. “Piano Bar” might not be the best description for what was going on here, though. This is not Billy Joel tinkling the ivories for a miserable crowd that is “sharing a drink they call loneliness.” While Woods does lead the upbeat show from his bench behind the piano, during this hour-plus long set he is joined by a band that includes guest singers, horns, guitars, and even an accordion. It might seem that a crowded piano bar on a cruise ship might not be the optimal location to record a live album, but this disc is very well produced. Credit for this goes out to the engineering work of Mark Brasel and Scott Burnett, and the mastering of Davis Farrell. Is everything about the recording perfect? Not particularly, but it is enjoyable to listen to and the lively and fun atmosphere carries over very well. Things certainly get out to a rousing start, with members of A Roomful of Blues joining in with Woods on “Big Mamou,” and their horns are simply wonderful. They appear on a few more tracks, including “Rip it Up” featuring the guitar of Tommy Castro, “Bright Lights, Big City” with Lucky Peterson on vocals, and “Eyesight to the Blind” led by Billy Branch on vocals and harp. As you will hear throughout the disc, Woods has the ability to attract talented folks! Branch also appears along with Coco Montoya on a stripped-down version of “Boom Boom.” And Club 88’s take on the classic “Rock Me Baby” also has a healthy dose of Montoya’s guitar over Mitch’s hearty voice and hammering keys. And the guest artists just keep on coming: Victor Wainwright and Julia Magness trade verses with Mitch on “Tain’t Nobody’s Bizness,” and it sounds like Victor sat in on the keys as well (this song was the highlight of the disc for me). Popa Chubby sat in for a few tracks, and Dwayne Dopsie brought his Zydeco squeezebox in for “Jambalaya” and a saucy take on “Whole Lotta Shakin’ Goin’ On,” which closed out the set. Interspersed with these songs are asides and anecdotes from Mitch, and his sense of humor and storytelling ability are as good as his skills behind the keyboard. These breaks include the history of how Club 88 came to be, musing about the advantages of cruising in international waters, and a funny story about some folks trying to hold their Alcoholics Anonymous meeting at Club 88. 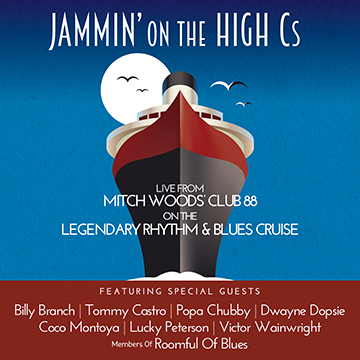 If you like piano-driven blues or if you have always wanted to go on the Legendary Rhythm & Blues Cruise, Mitch Woods’ Jammin’ on the High Cs is a must buy. There is not a bad song on it, and many of them are probably already your favorites. If you want to see the show in person, this year’s cruise is sold out but there is still time to save up a few bucks for next year!